It’s the perfect barber’s tool. The Model 10â¢ clipper pays homage to American quality and craftsmanship and celebrates the distinct tradition of technique, skill and design. The Limited Edition version includes a unique collector’s box with a numbered certificate of authenticity. The Model 10â¢ Clipper is sleek, compact and loaded with power too. Designed to last with durable, break-resistant housing. The clipper’s heavy-duty, universal motor stands up to all-day use and cuts any hair type using Classic 76Â® detachable blades. Top-rated for the experienced stylist/barber. Includes blade guard and cleaning accessories.““Powerful, universal motor for heavy-duty use“Detachable 000 blade“Durable, break-resistant housing“Includes blade guard, lubricating oil and cleaning brush“Extra long, 10 ft power cord“PLEASE NOTE-FREE SHIPPING POLICY DOES NOT APPLY TO ANY CLIPPERS AND WILL OVERIDE FREE SHIPPING POLICY ON ORDERS OVER $99.00 ALL ADDITIONAL SHIPPING CHARGES WILL NOT APPEAR ON YOUR INTERNET ORDER BUT WILL APPEAR ADDITIONAL ON YOUR INVOICE RECEIVED FROM US. 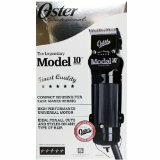 Oster Model One Heavy Duty Detachable Blade Clipper 76175-010 Oster Model One Heavy Duty Detachable Blade Clipper 76175-010 – t he MODEL ONE professional clipper is the new standard in heavy duty clippers. 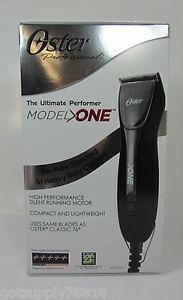 Much smaller and lighter than its competitors, MODEL ONE has the power to cut through any type of hair with amazing ease. Patent pending drive lever system and body design provide the ultimate combination of power and comfort.“PLEASE NOTE-FREE SHIPPING POLICY DOES NOT APPLY TO ANY CLIPPER AND WILL OVERIDE FREE SHIPPING POLICY ON ORDERS OVER $99.00 ALL ADDITIONAL SHIPPING CHARGES WILL NOT APPEAR ON YOUR INTERNET ORDER BUT WILL APPEAR ADDITIONAL ON YOUR INVOICE RECIEVED FROM US. Features:““Powerful, Heavy-Duty Universal Motor“Quick-Change Detachable Blade System“Size 1 Blade Included“Includes:““Turbo III Clipper“Size 1 Blade (76911-086)“Blade Guard“Blade Oil“Clipper Grease“Cleaning Brush“Instruction Sheet“PLEASE NOTE-FREE SHIPPING POLICY DOES NOT APPLY TO ANY CLIPPERS AND WILL OVERIDE FREE SHIPPING POLICY ON ORDERS OVER $99.00 ALL ADDITIONAL SHIPPING CHARGES WILL NOT APPEAR ON YOUR INTERNET ORDER BUT WILL APPEAR ADDITIONAL ON YOUR INVOICE RECEIVED FROM US. This cord/cordless clipper is all about versatility and performance. A Lithium Ion rechargeable battery provides longer-lasting run time and steady power to turn out more cuts with less recharging, or plug in to go non-stop! 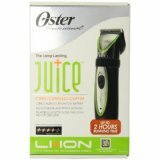 The JuiceÂ® Clipper is designed with an ergonomic rubberized body that makes it is easy to work with and provides a comfortable, controlled grip. The detachable, adjustable blade provides five different lengths for a variety of styles. Six additional guide comb attachments provide even more flexibility. Also includes blade guard and cleaning accessories.““Detachable, adjustable blade (000-1) provides five different lengths for a variety of styles“Six guide comb attachments add more flexibility and control to styling, from the shortest crew cuts to free-styled layers“Ergonomic rubberized body allows for controlled grip“Use cord or cordless“Power indicator light monitors battery charge“Docking/charging base stores and charges clipper“Lubricating oil and cleaning brush.“PLEASE NOTE-FREE SHIPPING POLICY DOES NOT APPLY TO ANY CLIPPER AND WILL OVERIDE FREE SHIPPING POLICY ON ORDERS OVER $99.00 ALL ADDITIONAL SHIPPING CHARGES WILL NOT APPEAR ON YOUR INTERNET ORDER BUT WILL APPEAR ADDITIONAL ON YOUR INVOICE RECEIVED FROM US. Lithium-Ion Cord/Cordless Clipper.“75+ minute run time.“1005 Standard Blade Fits All Wahl Guards.“Lightweight with Sleek Ergonomic Design. “Equipped With Taper Lever For Easy Fading and Blending.“8 ATTACHMENT COMBS.“PLEASE NOTE-FREE SHIPPING POLICY DOES NOT APPLY TO ANY CLIPPER AND WILL OVERIDE FREE SHIPPING POLICY ON ORDERS OVER $99.00 ALL ADDITIONAL SHIPPING CHARGES WILL NOT APPEAR ON YOUR INTERNET ORDER BUT WILL APPEAR ADDITIONAL ON YOUR INVOICE RECEIVED FROM US. 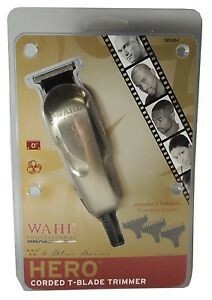 Wahl Hero Corded T-Blade Trimmer is a professional trimmer that allows you to create custom styles. The compact size makes for easy and comfortable handling, while the powerful motor trims hair quickly.““ “ “ “Description“Included:“3 T-shaped trimming guides“Oil“Cleaning brush“Operating instructions“PLEASE NOTE-FREE SHIPPING POLICY DOES NOT APPLY TO ANY TRIMMER AND WILL OVERIDE FREE SHIPPING POLICY ON ORDERS OVER $99.00 ALL ADDITIONAL SHIPPING CHARGES WILL NOT APPEAR ON YOUR INTERNET ORDER BUT WILL APPEAR ADDITIONAL ON YOUR INVOICE RECEIVED FROM US. WAHL COMPACT PROFESSIONAL HAIR CLIPPER MODEL 8291 IS A PROFESSIONAL TOOL THAT IS IDEAL FOR ANY BARBER OR STYLIST. 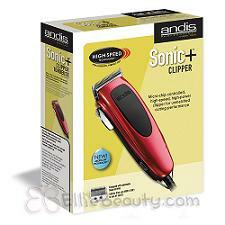 IT IS A COMPACT SIZE BUT HAS THE POWER OF A FULL SIZE CLIPPER WITH ITS ROTARY MOTOR. IT IS LIGHTWEIGHT AND FITS EASILY IN THE PALM OF YOUR HAND FOR OPTIMAL COMFORT. INCLUDES 6 ATTACHMENT COMBS AND A BLADE GUARD.“PRODUCT DETAILS“Lightweight“Fits easily in the palm of your hand“Rotary Motor“8 Foot professional grade chemical resistant cord“6 Attachment combs“Oil“Cleaning brush“Instructions“Red blade guard“SPECS“Motor : Rotary“Unit Weight : 6.9 oz.“Unit Length : 5 inches“Blade : 2126-100“Cord : 8 Foot Professional Grade, Chemical Resistant“120 Volts Only“Made in USA“PLEASE NOTE-FREE SHIPPING POLICY DOES NOT APPLY TO ANY CLIPPERS AND WILL OVERIDE FREE SHIPPING POLICY ON ORDERS OVER $99.00 ALL ADDITIONAL SHIPPING CHARGES WILL NOT APPEAR ON YOUR INTERNET ORDER BUT WILL APPEAR ADDITIONAL ON YOUR INVOICE RECEIVED FROM US. Sleek, black and chrome-finished trimmer is a great tool for shaping up beards, ‘staches, sideburns and body hair. Can be used cord-free and comes with a sleek stand.“PLEASE NOTE-FREE SHIPPING POLICY DOES NOT APPLY TO ANY TRIMMER AND WILL OVERIDE FREE SHIPPING POLICY ON ORDERS OVER $99.00 ALL ADDITIONAL SHIPPING CHARGES WILL NOT APPEAR ON YOUR INTERNET ORDER BUT WILL APPEAR ADDITIONAL ON YOUR INVOICE RECEIVED FROM US. -The only micro-chip controlled clipper for unmatched speed, power and cutting performance “- Has the power of a pivot motor and the high speed of a magnetic motor creating a smooth, perfect cut “- 6,000 strokes per minute – double the speed of other pivot motor clippers “- Blade adjusts from Size #000 (1/50inch) to Size #1 (3/32inch) “- Easily cuts wet or dry – thick or thin hair“PLEASE NOTE-FREE SHIPPING POLICY DOES NOT APPLY TO ANY CLIPPERS AND WILL OVERIDE FREE SHIPPING POLICY ON ORDERS OVER $99.00 ALL ADDITIONAL SHIPPING CHARGES WILL NOT APPEAR ON YOUR INTERNET ORDER BUT WILL APPEAR ADDITIONAL ON YOUR INVOICE RECEIVED FROM US.